This article is about Agouta. For Agouti, see Agouti. The Hispaniolan solenodon (Solenodon paradoxus), also known as the Haitian solenodon, or agouta, is a solenodon found only on Hispaniola, the island shared by Haiti and the Dominican Republic. It was first described by Brandt in 1833. A similar but smaller species, Marcano's solenodon (S. marcanoi), once lived on the island, but became extinct after European colonization. In 1833 the Russian Academy of Sciences received a new specimen from Haiti. Puzzled by the animal, curator Johann Friedrich von Brandt named it Solenodon paradoxus. (Solenodon means "grooved teeth".) No more information was known other than a relation to the Cuban solenodon discovered in 1861, and it was believed to be extinct. Addison Emery Verrill and Alpheus Hyatt Verrill rediscovered the animal in the Dominican Republic in 1907, but by 1964 it was again believed extinct. The Hispaniolan solenodon looks much like an oversized shrew; males and females are similar in size. Adults measure 49 to 72 cm (19 to 28 in) in total length, including a tail 20 to 25 cm (7.9 to 9.8 in), and weigh about 800 g (28 oz) on average. Although they are somewhat variable in colour, they are typically dusky brown over most of the body, with a paler underside and reddish fur on the sides of the head, throat and upper chest. The tail, legs, snout, and eyelids are hairless. The forelegs are noticeably more developed than the hind legs, but all have strong claws useful for digging. The head is very big in relation to its body, with a long rostrum and tiny eyes and ears partially hidden by the body fur. The nostrils open to the side and the snout has about a dozen long whiskers, up to 7 cm (2.8 in) in length, with a few smaller whiskers further back on the head. A unique feature is the os proboscidis, a bone extending forward from the nasal opening to support the snout cartilage; this is not found even in other solenodons. The dental formula for the species is 3.1.3.33.1.3.3 × 2 = 40. The second lower incisor has a narrow tubular channel that is almost entirely enclosed, through which flows a venomous saliva secreted by the submaxillary gland. Although the exact chemical composition of the venom is unknown, injection of 0.38 to 0.55 mg of venom per gram of body mass has been shown to be fatal to mice in two to six minutes. Hispaniolan solenodons have patches of skin rich in apocrine glands on the thighs. The secretions of these glands are used in communication between individuals. The Hispaniolan solenodon appears to have a patchy distribution. Populations are found both within and outside protected areas such as the Jaragua, Del Este and Sierra de Baoruco National Parks. In Haiti, it is reported from La Visite National Park and the Duchity region of the Massif de la Hotte. Its presence in Los Haitises National Park in the Dominican Republic is inferred, but unconfirmed. 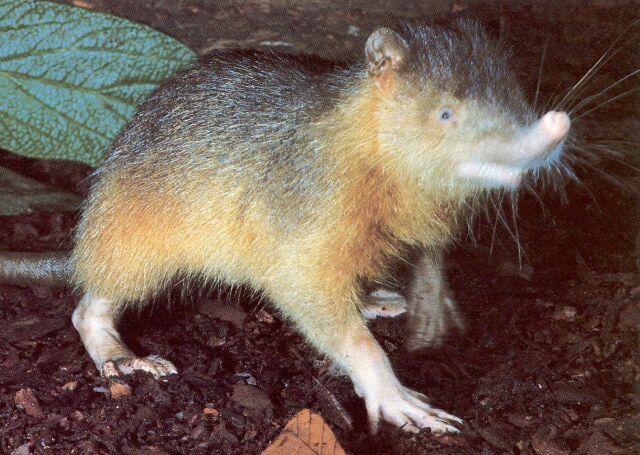 Hispaniolan solenodons are nocturnal; during daylight hours, they stay in their burrows, trees, hollowed-out logs or caves, remaining hidden from view. Their burrows may contain multiple chambers and tunnels and are typically inhabited by an adult pair accompanied by up to six younger family members. When they emerge into the open air, they run on the soles of their feet, following an erratic, zigzag course. Hispaniolan solenodons feed mainly on arthropods, but will also eat worms, snails, mice and small reptiles; they may also feed on a small amount of fruit, grains, and leaf litter. They probe the earth with their snouts and dig or rip open rotten logs with their claws. They have been reported to make a number of vocalisations, including a loud defensive "chirp", an aggressive "squeal", a soft "squeak" when encountering familiar conspecifics, and a high-pitched "clic" when encountering strangers. They have also been reported to make echolocation clicks at 9 to 31 kHz. Breeding occurs throughout the year, although the females are receptive only for short periods once every ten days or so. Litters of one to three young are born after a gestation period of over 84 days. Usually, only two of the offspring survive, because the female only has two teats, which are found towards the groin. The young are born blind and hairless, and weighing 40 to 55 g (1.4 to 1.9 oz). They are carried about by the mother for the first two months of life, although it is unknown how long it takes for them to be fully weaned. They can live for over eleven years in captivity. Because of a lack of natural enemies, the Hispaniolan solenodon did not evolve defenses against predators, and it is a slow, clumsy runner. When feral dog and cat populations became established and small Asian mongooses (specifically Herpestes javanicus auropunctatus) were introduced to control rats in sugar cane fields, its future was jeopardized. In 2016, researchers at the University of Illinois and the University of Puerto Rico completely sequenced the mitochondrial genome for the Hispaniolan solenodon. The study confirmed that the Hispaniolan solenodon diverged from all other living mammals about 78 million years ago. The study also found that there was much greater genetic diversity among the northern population than the southern population. This timeline aligns well with a hypothesis on how the Hispaniolan solenodon came to inhabit the island of Hispaniola. Geologists speculate that the island was part of a volcanic arc that connected to Mexico around 75 million years ago. The Hispaniolan solenodon was identified as one of the top ten "focal species" in 2007 by the EDGE Species project. A collaborative conservation project funded by the Darwin Initiative (UK) was started in 2009 and is researching the species to conserve it. The species is fully protected by law. However, national parks in both Haiti and the Dominican Republic are threatened by deforestation and encroachment for farming and charcoal production. The US Agency for International Development and the Nature Conservancy are[when?] working with local nongovernmental organisations to improve protection and implement management plans for these parks (the "Parks in Peril" programme). A recovery plan for the isolated Haitian population, published in 1992, advocated comprehensive surveys, improved management of the Pic Macaya National Park, education campaigns, control of exotic mammals, and an ex situ breeding programme. These recommendations have not yet[when?] been implemented. Two conservation research and education programmes funded by the Darwin Initiative have recently been established, focusing on solenodons in both countries: "Building evidence and capacity to conserve Hispaniola's endemic land mammals" (started 2009), and "Building a future for Haiti's unique vertebrates" (started 2010). These collaborative projects represent a partnership between the EDGE programme, the Durrell Wildlife Conservation Trust, BirdLife International, the Sociedad Ornitologica de la Hispaniola, the Dominican Republic National Zoo, Societe Audubon Haiti, and in-country project partners. Habitat loss and predation by introduced species have contributed to making it an endangered species; its numbers have dropped dramatically during the last few decades. It was actually considered almost extinct until 1907, when it was found living in the interior of Hispaniola. It was not considered to be in immediate danger early in the 20th century. In 1966, it was found in several localities in the Dominican Republic. As of 1981, after extensive searching, the Hispaniolan solenodon was declared "functionally extinct"[clarification needed] in Haiti, persisting only in the remote mountains of the south. In 1987, it was still found in both countries, but was thought to be particularly threatened in Haiti. As of 1996, it could still be found in both countries. Wildlife filmmaker Jürgen Hoppe has been able to film the Hispaniolan solenodon in various parts of the Dominican Republic during the last 18 years.[when?] The most recent sightings in the wild (with video evidence) were during the summer of 2008, when a team of researchers from the Durrell Wildlife Conservation Trust and the Ornithological Society of Hispaniola were able to trap an individual specimen. The researchers took physical measurements and DNA from it before releasing it back into the wild. ^ Hutterer, R. (2005). "Order Soricomorpha". In Wilson, D.E. ; Reeder, D.M (eds.). Mammal Species of the World: A Taxonomic and Geographic Reference (3rd ed.). Johns Hopkins University Press. p. 223. ISBN 978-0-8018-8221-0. OCLC 62265494. ^ a b Turvey, S. & Incháustegui, S. (2008). 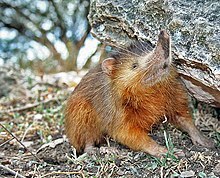 "Solenodon paradoxus". The IUCN Red List of Threatened Species. IUCN. 2008: e.T20321A9186243. doi:10.2305/IUCN.UK.2008.RLTS.T20321A9186243.en. Retrieved 24 December 2017. ^ Ley, Willy (December 1964). "The Rarest Animals". For Your Information. Galaxy Science Fiction. pp. 94–103. ^ a b c d e f g Derbridge, J.J.; et al. (December 2015). "Solenodon paradoxus (Soricomorpha: Solenodontidae)". Mammalian Species. 47 (927): 100–106. doi:10.1093/mspecies/sev010. ^ Wible, J.R. (December 2008). "On the cranial osteology of the Hispaniolan solenodon, Solenodon paradoxus Brandt, 1833 (Mammalia, Lipotyphla, Solenodontidae)". Annals of Carnegie Museum. 77 (3): 321–402. doi:10.2992/0097-4463-77.3.321. ^ Folinsbee, K.A. ; Müller, J. & Reisz, R.R. (2007). "Canine grooves: morphology, function, and relevance to venom". Journal of Vertebrate Paleontology. 27 (2): 547–551. doi:10.1671/0272-4634(2007)27[547:CGMFAR]2.0.CO;2. ^ Dutton, M.J. (1992). "Venomous Mammals". Pharmacology & Therapeutics. 53 (2): 199–215. doi:10.1016/0163-7258(92)90009-O. ^ Starck, D. & Poduschka, W. (1982). "On the ventral gland field of Solenodon paradoxus Brandt, 1833 (Mammalia, Insectivora)". Zeitschrift für Säugetierkunde. 47 (1): 1–12. ^ Turvey Samuel T.; Meredith Helen M.R. ; Scofield R. Paul (2008). "Continued survival of Hispaniolan solenodon Solenodon paradoxus in Haiti". Oryx. 42 (4): 611–614. doi:10.1017/S0030605308001324. ^ "Endangered venomous mammal predates dinosaurs' extinction | Carl R. Woese Institute for Genomic Biology". www.igb.illinois.edu. Retrieved 2016-05-03. ^ Roca, A.L. ; et al. (April 2004). "Mesozoic origin for West Indian insectivores". Nature. 429 (6992): 649–651. doi:10.1038/nature02597. PMID 15190349. ^ "Protection for 'weirdest' species". BBC. 2007-01-16. Retrieved 2007-05-22. ^ "The Last Survivors project". ^ "Venomous mammal caught on camera". BBC. 2009-01-09. Retrieved 2009-01-09. Picture of S. paradoxus Best photo available on the web. BBC article with video - "Solenodon hunt: On the trail of a 'living fossil'"
BBC article with video - "The cave of bones: A story of solenodon survival"
BBC article with video - "Solenodon hunt: Close encounter with a bizarre beast"
This page was last edited on 28 February 2019, at 21:47 (UTC).